Belching out a defiant, aquatic roar. Breaking the surface with euphoric feedback. Detect every subtle key change in your ode. A true understanding of what makes you float. 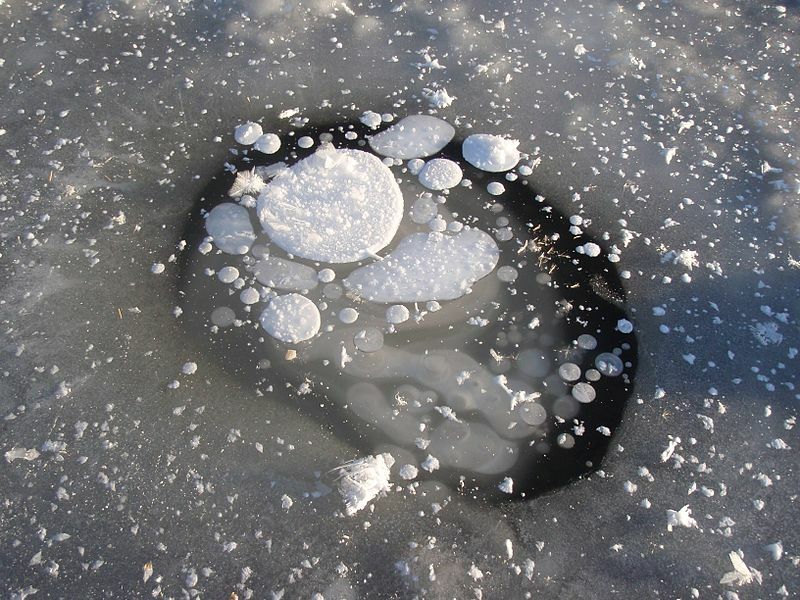 Frozen methane bubbles (Photo Credit: U.S. Geological Survey from Reston, VA, USA). This is a Terza Rima, inspired by recent research which has demonstrated how acoustics can be used to identify methane seeping from the ocean floor. In recent years, scientists have observed hundreds of streams of bubbles that are produced by methane deposits below the ocean floor. This is potentially a very large source of a greenhouse gas and has implications for global climate change. However, until now researchers have had no clear way of being able to determine exactly how much methane is seeping out from these deposits. By listening to the bubbles using a hydrophone, the researchers in this study were able to record the sounds that they made, relating the frequency of the sound to the size of the bubble. A smaller bubble would have a higher pitch, whereas a larger bubble (containing more methane) would have a lower pitch. The estimates of bubble size according to frequency were validated against visual images of the bubbles and found to be correct. It is now hoped that this approach can be used to better measure the volume and rate of methane gas exiting from the ocean floor.